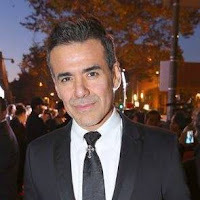 Luis Salgado, shown above left, was featured in El Blog de Pablo (written by Pablo García Gámez) as a result of two projects he is working on– one current and one upcoming. He can currently be seen in the musical On Your Feet! The musical is based on the lives of Gloria and Emilio Estefan (featuring their music) and has a book written by Alexander Dinelaris. Currently in previews at the Oriental Theater in Chicago, after its out-of-town tryout there, it will head to Broadway in October at the Marquis Theatre. For more information, click here. Salgado will also be directing the Puerto Rico premiere of David Mamet's Speed-the-Plow (titled Jala la pala in Spanish). 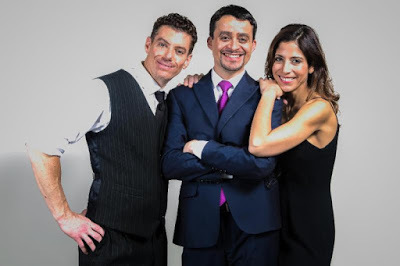 The production boasts an all-HOLA member cast in Éric-Dominique Pérez, Javier E. Gómez and Emmanuelle Bordas (shown above right, from left to right) and will run in August at El Corralón de San José in Viejo San Juan, Puerto Rico. To read the blog (which is in Spanish), click here. José Yenque, shown at right, was honored by the first annual Las Vegas International Latino Film Festival with its Humanitarian Award for the work he does managing Arts for a Better Tomorrow (ABT), the organization he founded. ABT is a bi-national (U.S.-Mexico), not-for-profit organization that harnesses the transformational power of the arts, to provide underserved youth with life skills, academic readiness, and a strategic path to a healthy, productive, and self-sustaining future. For more information about ABT and its work, click here or here. Joel Pérez, shown at left, was profiled in Broadway World, where he mentioned his favorite Broadway show albums. 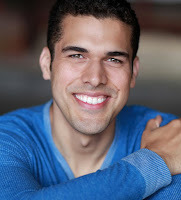 (Pérez can currently be seen on Broadway at the Circle in the Square Theatre in the Jeanine Tesori-Lisa Kron Tony-nominated musical Fun Home, which is based on the Alison Bechdel novel of the same name.) To read the article, click here. Sandor Juan is starring in the Tirso de Molina play El burlador de Sevilla. Directed by Victoria Collado, the production will take place in July and August at Repertorio Español, located in the Rose Hill neighborhood of Manhattan. For more information, click here. Vladimir Ríos completed the final of four photo series where he will portray The Warrior of Hope (as photographed by Lester Blum). The Warrior of Hope personifies the concept of "hope" for those who are ill, downtrodden, and oppressed against inequality, injustice, and disease. The photo series will be exhibited and have its opening in July at a gallery show at the Project Space of the Leslie Lohman Museum and Gallery in Manhattan's SoHo neighborhood. For more information, click here and here. A.B. 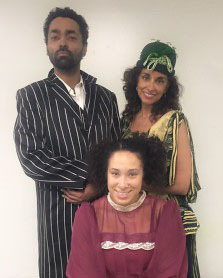 Lugo, Kathy Tejada and Alexandra Manzano, shown clockwise from top left in the photo at right, were featured in two blogs– Héctor Luis Sin Censura and ArteNY– for their work in the upcoming Teatro Experimental Blue Amigos production of A Solid Home. Written by Elena Garro and directed by Héctor Luis Rivera, the play will take place in June at the Broadway Blackbox Theater, located in Manhattan's Washington Heights neighborhood. To read the respective blogs, click here and here (note that the former, Héctor Luis Sin Censura, is in Spanish).